Produced on an budget of ₹200 crore (US$28 million), Zero is Khan's most expensive film. The film was conceived by Rai in 2012, before pre-production began in 2016. Initially having a working title of Katrina Meri Jaan, Zero went through numerous title changes before arriving at the final title in early 2018. Principal photography of the film began in Mumbai on May 2017. It marked the last film appearance of Sridevi, who died shortly after completing the film. Filming concluded in 2018 at Orlando. The film's soundtrack is composed by Ajay-Atul with lyrics written by Irshad Kamil, under the label T-Series. It was released on 21 December 2018, to mixed reviews from critics. Critics particularly praised the film's visual effects and the performances of Khan and Kaif, but the screenplay was criticised for its inconsistency. It earned ₹90.39 crore in India in the first seven days after its release, but was unable to recoup its budget. Bauua Singh (Shahrukh Khan) is a short, 38-year-old man from Meerut who has trouble finding a marriage partner. After using matrimonial agencies with little luck, he eventually finds his companion in Aafia Yusufzai Bhinder (Anushka Sharma), a NASR scientist (a fictionalized depiction of NASA) with cerebral palsy. In the events that followed, both fall in love with each other, but Bauua dumps her after five months. However, Aafia comes looking for him, and Bauua's parents fix their marriage. On their marriage day, Bauua's friend Guddu (Mohammed Zeeshan Ayyub) tells him that he is shortlisted for a dance competition where he applied, where the winner gets a chance to meet Babita Kumari (Katrina Kaif), a Bollywood actress. Bauua, determined to meet Babita, runs away from the marriage after a confrontation with Aafia, leaving everyone devastated. Bauua wins and gets to meet Babita at a party, accompanied by other famous Bollywood actors. Babita offers him a job after he displays an ability to guess what goes on in people's mind by observing their expressions. He accompanies her on film schedules and award functions, helping her patch up with her ex-boyfriend Aditya Kapoor (Abhay Deol), who had previously cheated on her. One day, Bauua realizes his wrongdoings and wishing to reconcile with Aafia, willingly creates an argument at a party organized by Babita, following which Babita throws him out and breaks all ties with Aditya, realizing the latter is cheating on her again. Bauua and Guddu travel to New York, where Aafia is attending a seminar. Bauaa crashes the seminar to meet her, but Aafia refuses to see him. Aafia's father tells him that Bauua has fathered a son with Aafia and the latter is pregnant, due to which she wanted him to marry her in the first place. A heartbroken Bauua decides to leave the city, but decides to try his luck one more time. After meeting with Aafia again at NASR and getting rejected by her, Bauua enlists in a program recruiting human volunteers to be sent to Mars on a rocket. After painstaking training and getting help from one of the applicants, Bauaa gets selected, while Guddu is rejected for his vision disability. On the day of his launch, Aafia, who is supposed to marry Srinivasan (R. Madhavan), a fellow scientist and Aafia's colleague, leaves him, and she reaches NASR seconds before Bauua's launch. Bauua assures her that he always loved her, just before the rocket takes off. The launch is witnessed by Aafia, Guddu and Srinivasan, along with Babita and Bauua's family via television broadcast. The launch is successful, and the rocket thrusts off in space. In a voice-over by Aafia, it is revealed that Bauua eventually reaches Mars, and sends a video recording of himself from there. His rocket gets lost in space somewhere while returning, and Aafia waits for him, having broken her marriage with Srinivasan. Fifteen years later, a Chinese space station receives the signal of Bauua's escape pod, which crash lands in an ocean, revealing Bauua is still alive and has not aged. The film was initially titled Katrina Meri Jaan. However, this was later scrapped because the producers thought the title would be too misleading to people and make them presume the film is about Kaif. In between productions, the film underwent through numerous working titles such as Bauaa, Bauna, Butka, Bandhua and Batla. Red Chillies Entertainment registered three names for use as the film's title. In the end, a unanimous decision was made to call the film Zero, revealed in January 2018. Tigmanshu Dhulia will portray Khan's father. He showed interest in the project after hearing about its heavy technical involvements. Abhay Deol was cast as a love interest, and R. Madhavan, who had previously worked with Rai in both Tanu Weds Manu films, announced his casting by sharing a selfie with Rai on the film's set in late May 2018. Khan refrained from signing any other film during Zero's production. The film features guest appearances by Salman Khan, Rani Mukerji, Deepika Padukone, Kajol, Alia Bhatt, Sridevi, Karisma Kapoor and Juhi Chawla who will portray themselves. This will mark Sridevi’s last appearance in a film, as she died before the film's release shortly after filming. The film's soundtrack was composed and produced by Ajay−Atul. Tanishk Bagchi worked as a guest composer. Lyrics are written by Irshad Kamil and Kumaar. The first song, "Mere Naam Tu", was sung by Abhay Jodhpurkar and arranged by Ustad K. Shayan-Hosseini (who also played its piano pieces); other instrumentals include the Indian flute by Varad Kathapurkar and the Nylon guitar by Pawan Rasayli. The third song "Husn Parcham", was sung by Bhoomi Trivedi (famed by Ram Chahe Leela song) and another newcomer in Bollywood Raja Kumari. In mid-December 2018, the film passed the British Board of Film Classification with a certified 12A rating and a 164-minute runtime. In Pakistan, Zero was cleared by the Central Board of Film Censors without any cuts. It was released in 156 screens across the country by local distributor Eveready Pictures, which is said to be the highest number of screens for any film in Pakistan. The film, which was initially planned for a 20 December 2018 release in Germany, was postponed on 17 January 2019, to ensure a wider release. The film is also planned for release in China some time before March 2019. On 1 November, the day before the release of the trailer, two official posters were revealed by Khan on his social media pages: one featuring Khan's character Bauua Singh and Anushka Sharma's character in Connaught Place in New Delhi, and another with Singh and Katrina Kaif's character in front of Meerut's clock tower. On the morning of 2 November, Director Aanand L. Rai released a third poster on his Twitter page, depicting Khan's Bauua Singh standing on a street near Broadway in New York City. The same day, Red Chillies Entertainment released the official trailer on YouTube. The trailer recorded more than 54 million views within 24 hours, and eventually recorded the fastest 100 million views on YouTube for any Indian film, surpassing Thugs of Hindostan to become YouTube's most-watched Indian trailer of all time. On 10 November, Zero's trailer was screened at the 24th Kolkata International Film Festival in the presence of Khan and West Bengal Chief Minister Mamta Banerjee. On 20 November, Red Chillies Entertainment uploaded an official promo video to their Youtube channel. On the same day, the film's makers launched an exclusive Bauua Singh WhatsApp sticker pack available for download. Zero collected ₹20.14 crore at the box office on its first day; the following day it earned ₹18.22 crore and on third day ₹20.71 bringing its first weekend domestic earning total to ₹59.07 crore. It earned on Monday ₹9.50 crore and on Tuesday (Christmas holiday) ₹12.75 crore in domestic circuit. ↑ Red Chillies Entertainment sold the domestic distribution rights for Zero to individuals, rather than a single production house. Yash Raj Films (YRF) will handle international distribution on a commissioned basis. ↑ "EXCLUSIVE: Shah Rukh Khan reveals Nusrat Fateh Ali Khan's 'Main Roz Roz Tanha' is recreated in Zero". Bollywood Hungama. Retrieved 18 December 2018. ↑ "Shahrukh Khan dazzles in his upcoming film's teaser". Daily Times. 4 January 2018. Archived from the original on 26 January 2018. Retrieved 11 January 2018. ↑ Mankad, Himesh (26 October 2018). "EXCLUSIVE: All India distribution rights of Shah Rukh Khan's Zero sold for Rs 100 Crore on Advance Basis!". Bollywood Hungama. Retrieved 9 November 2018. ↑ "Shah Rukh Khan's new film with Anand L Rai to release on february01, 2019". The Indian Express. 31 August 2016. Archived from the original on 9 November 2016. Retrieved 29 July 2017. ↑ "Zero". British Board of Film Classification. Retrieved 2018-12-14. 1 2 "Shah Rukh Khan Has A Contingency Plan For His Film, Zero". Mid Day. 6 October 2018. 1 2 3 "Zero Box Office Collection till Now - Bollywood Hungama". Bollywood Hungama. Retrieved 14 January 2019. ↑ "Zero box office collection day 7: Shah Rukh Khan starrer slows down; earns Rs 90.39 crore. Will it go past Rs 100 crore mark? | Entertainment News". www.timesnownews.com. Retrieved 2018-12-28. ↑ "Zero teaser: Shah Rukh Khan, Salman Khan wish Eid Mubarak in style; watch". The Financial Express. 2018-06-14. Retrieved 2018-06-16. ↑ "Zero teaser released: Fans celebrate Shah Rukh Khan and Salman Khan's friendship with hilarious memes". Retrieved 2018-06-16. ↑ Red Chillies Entertainment (2 November 2018). "Zero - Official Trailer - Shah Rukh Khan - Aanand L Rai - Anushka - Katrina - 21 Dec 2018". YouTube. Retrieved 2 November 2018. ↑ Desk, News (3 November 2018). "The trailer of Shah Rukh Khan's 'Zero' trending 2nd on social media". Globalvillagespace.com. Retrieved 3 November 2018. ↑ "Katrina Kaif has joined us, Anushka Sharma will join soon: Shah Rukh Khan on Aanand L Rai's film". Hindustantimes.com. 25 September 2017. Archived from the original on 24 October 2017. Retrieved 4 November 2017. ↑ "Zero: Katrina Kaif Reveals She Wanted to Play Aafia but the Role Went to Anushka Sharma – Watch Video". Yahoo.com. 5 November 2018. Retrieved 5 November 2018. ↑ "Why Shah Rukh Khan's Raees Co-Star Mohammed Zeeshan Ayyub Is Trending In Connection With Zero". NDTV. Retrieved 26 November 2018. ↑ "Aanand L Rai signs Tigmanshu Dhulia for his next film starring Shah Rukh Khan". Mid-day.com. Archived from the original on 29 July 2017. Retrieved 29 July 2017. 1 2 Staff, Scroll. "A larger-than-life celebration of love and imperfection: Anushka Sharma on Aanand L Rai's 'Zero'". Scroll.in. Retrieved 2018-12-02. 1 2 "Zero Trailer: Shah Rukh Khan as Bauua Singh Spells Magic But Katrina Kaif and Anushka Sharma Steal The Show Too - Watch Video". Latestly.com. Retrieved 2 November 2018. ↑ "Zero Movie Review: Shah Rukh Khan, Anushka Sharma's Insipid Tale of Bizarre Possibilities". News18. Retrieved 2018-12-21. 1 2 "Abhay Deol to play Katrina Kaif's love interest in 'Zero'". Bizasialive.com. 5 March 2018. ↑ "'Zero' Spoiler Alert: These indirect references made to Katrina Kaif's ex Ranbir Kapoor are just too hard to be ignored". dna. 2018-12-21. Retrieved 2018-12-21. 1 2 Gaikwad, Pramod (24 May 2018). "Madhavan to star in Aanand L Rai's Zero alongside Shah Rukh, Katrina Kaif, Anushka Sharma". International Business Times. Retrieved 27 May 2018. ↑ "Shah Rukh Khan and Salman Khan share a selfie moment on the sets of Anand L Rai's next film leaving fans curious, see photos". Indianexpress.com. 6 July 2017. Archived from the original on 29 July 2017. Retrieved 29 July 2017. ↑ "Shah Rukh Khan's Zero Puts Model Sushrii Shreya Mishraa On Trends List. Details Here". 1 2 3 4 5 "'Dwarf' SRK serenades his lovely ladies again - Pune Mirror -". Punemirror.indiatimes.com. Archived from the original on 29 October 2017. Retrieved 4 November 2017. ↑ "Deepika Padukone Talks About Her Role In Shah Rukh Khan's Next With Aanand L Rai". Businessofcinema.com. 18 October 2017. Archived from the original on 29 October 2017. Retrieved 4 November 2017. 1 2 "Zero Song Issaqbaazi: Watch Shah Rukh Khan Dance with Salman Khan, Ganesh Acharya, Remo D'Souza". News 18. Retrieved 5 December 2018. ↑ "Fire On Sets Of Shah Rukh Khan-Starrer 'Zero' In Mumbai Film City: Report". NDTV.com. Retrieved 2018-12-02. 1 2 3 Shruti Shikha (2 January 2018). "Zero First Poster: Pint-Sized Shah Rukh Khan Makes Huge Impact". NDTV. Archived from the original on 2 January 2018. Retrieved 2 January 2018. 1 2 Roshmila Bhattacharya (7 August 2017). "AANAND L RAI OPENS UP ABOUT HIS DWARF FILM WITH SHAH RUKH KHAN: I WANTED TO CUT TWO FEET FROM A STAR AS BIG AS KHAN SAAB". Mumbai Mirror. Archived from the original on 2 October 2017. Retrieved 2 January 2017. 1 2 3 4 "Zero: Everything we know about the Shah Rukh Khan starrer so far". The Indian Express. 2 January 2018. Archived from the original on 2 January 2018. Retrieved 2 January 2018. 1 2 "The ex-factor? Here's why Katrina Kaif had the name changed of her film with Shah Rukh Khan". DNS India. 24 August 2017. Archived from the original on 3 January 2018. Retrieved 2 January 2018. ↑ "Shah Rukh Khan is not in any hurry to reveal his look in the Aanand L Rai film". India Today. 10 November 2017. Archived from the original on 18 December 2017. Retrieved 2 January 2018. ↑ "Unanimous decision to title the movie Zero, says Aanand L Rai". The Asian Age. Archived from the original on 3 January 2018. Retrieved 4 January 2018. ↑ Hungama, Bollywood (17 March 2017). "BREAKING: Rs. 150 cr. budget for Dwarf film starring Shah Rukh Khan? - Bollywood Hungama". Bollywoodhungama.com. Archived from the original on 7 January 2018. Retrieved 11 January 2018. ↑ "Confirmed! Shah Rukh Khan to play a dwarf in Aanand L Rai's next - Shah Rukh Khan: Lesser known facts | The Times of India". The Times of India. Archived from the original on 3 January 2018. Retrieved 2 January 2018. 1 2 "Zero first look: Shah Rukh Khan reveals title, teaser and release date of upcoming film with Aanand L Rai". Firstpost. 1 January 2018. Archived from the original on 1 January 2018. Retrieved 1 January 2018. ↑ "Shah Rukh Khan talks about playing a dwarf in Aanand L Rai's next: We don't have to empathise with differently abled people". Indianexpress.com. 3 June 2017. Retrieved 26 January 2018. 1 2 3 Roshmila Bhattacharya (2 January 2018). "ZERO DIRECTOR AANAND L RAI ON SHAH RUKH KHAN: 'EVEN IF YOU CUT TWO FEET OFF, KHANSAAB WILL STILL STAND TALL'". Mumbai Mirror. Archived from the original on 1 January 2018. Retrieved 2 January 2018. ↑ "Shah Rukh Khan, 2-Feet Shorter. Director Reveals Why He Made 'Khan Saab' A Dwarf". NDTV.com. Archived from the original on 7 August 2017. Retrieved 2 January 2018. ↑ Jain, Arushi (4 January 2018). "Not just Shah Rukh Khan, these actors also took the role of a vertically challenged man". The Indian Express. Archived from the original on 4 January 2018. ↑ "Salman Khan behind SRK-Katrina casting coup for Aanand L Rai's next?". Deccanchronicle.com. 29 May 2017. Archived from the original on 6 July 2017. Retrieved 11 January 2018. ↑ "Katrina Kaif on SRK s film: I was supposed to play myself in Zero". Mid-day.com. 5 January 2018. Archived from the original on 5 January 2018. Retrieved 11 January 2018. ↑ "Katrina Kaif just confirmed that Zero's script and title has been changed over the last two years". Times Now. 20 January 2018. Retrieved 26 January 2018. 1 2 "For Zero, Shah Rukh Khan and Anushka Sharma visit US Consulate Mumbai". Timesnownews.com. ↑ "Sridevi will be seen one last time in Shah Rukh Khan's Zero. See pics". hindustantimes.com/. 2018-02-25. Retrieved 2018-02-26. ↑ "Shah Rukh Khan victim of death hoax, European news network says star died in air crash". The Indian Express. 1 June 2017. Archived from the original on 1 June 2017. Retrieved 10 June 2017. ↑ "The Status Of Shah Rukh Khan's Film In Which He Plays A Dwarf". NDTV.com. Archived from the original on 12 September 2017. Retrieved 2 January 2018. ↑ "Anushka Sharma Returns to Zero Set, Shah Rukh Khan Extends a Floral Welcome". News18.com. Archived from the original on 11 January 2018. Retrieved 11 January 2018. ↑ "SRK's another experiment with VFX - 'Zero': Interesting facts about the Shah Rukh Khan starrer film - The Times of India". The Times of India. Archived from the original on 8 January 2018. Retrieved 11 January 2018. ↑ "Shah Rukh Khan celebrates Makar Sankranti on 'Zero' sets—Pic". Zeenews.india.com. 15 January 2018. Retrieved 26 January 2018. ↑ "Shah Rukh Khan and Anushka Sharma spotted on the sets of Zero, see pictures". Indiatvnews.com. Retrieved 26 January 2018. ↑ "Kajol shoots for Shah Rukh Khan's Zero". M.filmfare.com. ↑ "Shah Rukh Khan's latest movie 'Zero' was partially shot in Dubai". The National. 10 November 2018. 1 2 "Shah Rukh Khan on Zero being the game-changer for him | filmfare.com". www.filmfare.com. Retrieved 2018-12-20. ↑ "Aanand L Rai flew down 300 people from Meerut to recreate the set of Zero movie in Mumbai". mid-day. 2018-12-20. Retrieved 2018-12-20. ↑ "Honey, I Shrunk Shah Rukh Khan. The Role Of VFX In His Next Film". NDTV.com. Archived from the original on 12 September 2017. Retrieved 2 January 2018. ↑ "Aanand L Rai on working with Shah Rukh Khan in Zero: There is nervousness and I enjoy that". Indianespress.com. 7 January 2018. Archived from the original on 8 January 2018. Retrieved 11 January 2018. 1 2 "This profession could turn you into a monster or it could turn you into a saint: Anushka Sharma". www.telegraphindia.com. Retrieved 2018-12-02. 1 2 "Interview | I liked Babita Kumari in 'Zero' because she's always fighting for herself, says Katrina Kaif". The New Indian Express. Retrieved 2018-12-20. ↑ Media, Sanskriti (24 January 2018). "Aamir, Salman and SRK to shoot together!". Emirates247.com. Retrieved 26 January 2018. ↑ "Shah Rukh Khan all set to promote Zero during all festivals this year". M.filmfare.com. ↑ "Shah Rukh Khan flies from Vile Parle to Vasai to escape Mumbai traffic for Zero shoot". M.businesstoday.in. ↑ "Indian movie megastar Shah Rukh Khan filming in Alabama". Al.com. ↑ "Shah Rukh Khan Wraps Zero, Thanks Crew For 'Fruitful And Hectic Shoot'". Ndtv.com. Retrieved 3 October 2018. ↑ Stokes, Alex (2018-12-17). "Huntsville makes its Bollywood debut Friday". WHNT.com. Retrieved 2018-12-18. ↑ "Zero - Original Motion Picture Soundtrack". Saavn. ↑ Hungama, Bollywood (2018-12-14). "EXCLUSIVE: Shah Rukh Khan reveals Nusrat Fateh Ali Khan's 'Main Roz Roz Tanha' is recreated in Zero". Bollywood Hungama. Retrieved 2018-12-18. ↑ "Shah Rukh Khan and Anushka Sharma starrer Zero to release across 5965 screens worldwide - details inside | Bollywood News". www.timesnownews.com. Retrieved 20 December 2018. ↑ "Shah Rukh Khan's Zero film gets the third highest screen count of 2018 in India". www.indiatvnews.com. 2018-12-21. Retrieved 2018-12-21. ↑ "Zero: The Runtime of Shah Rukh Khan, Katrina Kaif and Anushka Sharma's Film REVEALED!". Latestly. 14 December 2018. Retrieved 20 December 2018. ↑ "Exclusive Live Feed: Screen Count of Zero in Pakistan". entertainmentpk.com. Retrieved 20 December 2018. ↑ "Yash Raj Films confirms German release for Shah Rukh Khan starrer ZERO". Bollyspice. 5 December 2018. ↑ "Good News! Shah Rukh Khan's Zero to release in China early next year, confirms Aanand L Rai". Times Now. 31 October 2018. ↑ Anvita Singh (1 January 2018). "Zero: Shah Rukh Khan reveals title of his next film, set to impress in a never-seen-before avatar". The Indian Express. Archived from the original on 2 January 2018. Retrieved 1 January 2018. ↑ "Aanand L Rai: I wanted to celebrate incompleteness with 'Zero'". The Times of India. 2 January 2018. Retrieved 2 January 2018. ↑ Divya Goyal (2 January 2017). "Shah Rukh Khan's Zero: Could You Spot Katrina Kaif In Film Teaser?". NDTV. Archived from the original on 2 January 2018. Retrieved 2 January 2017. ↑ "Zero: Everything you need to know about Shah Rukh Khan, Katrina Kaif, Aanand L Rai's ambitious film". Hindustan Times. 2 January 2018. Retrieved 2 January 2018. ↑ "10 Million and counting! Thank you for the love .. #ChhaGayaZERO Watch the title announcement now - bit.ly/Zero-Title @iamsrk @aanandlrai @AnushkaSharma #KatrinaKaif @gaurikhan @cypplOfficial". Twitter. 2 January 2018. Archived from the original on 3 January 2018. Retrieved 2 January 2018. ↑ Hungama, Bollywood (9 January 2018). "Behind the Scenes: Here's how Avinash Gowariker shot the poster of Shah Rukh Khan's Zero - Bollywood Hungama". Bollywoodhungama.com. Archived from the original on 11 January 2018. Retrieved 11 January 2018. ↑ "'Zero' teaser: Shah Rukh Khan dances with Salman Khan in a never seen before avatar - Times of India ►". The Times of India. Retrieved 2018-06-14. ↑ "ZERO: The trailer of the Shah Rukh Khan film to be unveiled on his birthday". Bollywood Hungama. 24 August 2018. Retrieved 1 November 2018. ↑ "Shah Rukh Khan aka Bauua Singh from 'Zero' joins Twitter". The Times Of India. 26 October 2018. Retrieved 30 October 2018. ↑ "Zero: 'Zero': Shah Rukh Khan engages in hilarious Twitter banter with his character Bauua Singh". The Times Of India. 29 October 2018. Retrieved 29 October 2018. ↑ "Zero movie posters: SRK is adorable, Anushka is a smiling beauty and Katrina is oozing oomph". Indianexpress.com. 1 November 2018. Retrieved 1 November 2018. ↑ "Almost Zero Hour: Shah Rukh Khan's Birthday Countdown Begins With New Posters". Ndtv.com. Retrieved 1 November 2018. ↑ Iyengar, Shriram. 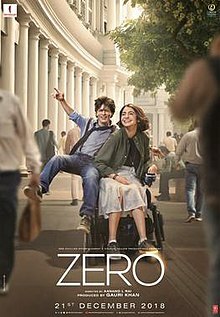 "Paraplegic Anushka, gorgeous Katrina mark two forms of beauty in Zero posters". Cinestaan.com. Retrieved 1 November 2018. ↑ "Happy Birthday Shah Rukh Khan: Aanand L Rai wishes his Khan Saab by sharing a new Zero poster". Pinkvilla.com. Retrieved 2 November 2018. ↑ "Shah Rukh Khan starrer Zero's trailer breaks record". Mid-Day. 4 November 2018. Retrieved 4 November 2018. ↑ "Zero trailer breaks all records; fastest Indian movie trailer to hit 100 million views on YouTube". Mid-Day. 4 December 2018. Retrieved 11 December 2018. ↑ "Amitabh Bachchan inaugurates Kolkata film festival, Shah Rukh's Zero trailer screened". Hindustan Times. 10 November 2018. ↑ "This NEW promo of Shah Rukh Khan-starrer Zero will make the wait for its release even harder - watch video". Times Now News. Retrieved 20 November 2018. ↑ "ZERO ko WhatsApp stickers ki 'Feel aa gayi' – The first ever Indian Film to launch the WhatsApp sticker pack!". firstpost. Retrieved 21 November 2018. ↑ "Shah Rukh Khan with daughter Suhana Khan teases Anand L. Rai over his obsession with samosa in this BTS video". India TV News. Retrieved 22 November 2018. ↑ Red Chillies Entertainment [@RedChilliesEnt] (21 November 2018). "Guys, we hear you loud and clear: You can't get enough of @BauuaSingh! With just #1MonthToZero, here's a special gift for you, #BauuaKiDukaan live now! Visit the store and get ready for the big day: shop.redchillies.com" (Tweet) – via Twitter. ↑ "The first song of Zero, Mera Naam Tu, to drop November 23, Shah Rukh Khan announces on Twitter with a photo". Times Now News. 22 November 2018. Retrieved 22 November 2018. ↑ "Zero song Mera Naam Tu: Shah Rukh Khan and Anushka Sharma beautifully depict the colour of love". Times Now News. Retrieved 23 November 2018. ↑ "Anushka-Shah Rukh Khan's 'Mere Naam Tu' depicts a romance between equals". Times of India. Retrieved 23 November 2018. ↑ "Say hello to Bauua Ki Toli: The makers of ZERO launch a fan engagement initiative- Entertainment News, Firstpost". Firstpost. Retrieved 2018-11-30. ↑ "Zero song Issaqbaazi: The much-awaited track featuring Shah Rukh Khan and Salman Khan out tomorrow - view poster | Bollywood News". Retrieved 2018-12-03. ↑ "Zero song Issaqbaazi: Shah Rukh Khan and Salman Khan burn the dance floor". The Indian Express. 2018-12-04. Retrieved 2018-12-04. ↑ report, Staff. "Where to meet Shah Rukh Khan in Dubai this week". Khaleej Times. Retrieved 2018-12-06. ↑ "Shah Rukh Khan enjoys and interacts with fans in Dubai - Times of India". The Times of India. Retrieved 2018-12-06. ↑ Khan, Shah Rukh (2018-12-06). "This much love for #Zero, only possible in Dubai. Thanks Global Village for the 100,000 hearts beating for Bauua, Aafia & Babita. Will convey ur #Ishaqbaazi to them in India. Love u Dubaiwaalon yeh dekho Bauua ki selfie!pic.twitter.com/Os5S2VJBnc". @iamsrk. Retrieved 2018-12-06. ↑ Sachin, Ambica. "Shah Rukh Khan shrugs off fall from Forbes rich list". Khaleej Times. Retrieved 2018-12-06. ↑ "Zero Song Husn Parcham Teaser | Katrina Kaif | Sharkhuh Khan | Husn Parcham Video Song from Zero". timesofindia.indiatimes.com. Retrieved 2018-12-10. ↑ "Zero new dialogue promo: SRK as Bauua Singh is all set to bring the house down with his hilarious antics - watch video | Bollywood News". www.timesnownews.com. Retrieved 2018-12-14. ↑ Choudhury, Bedatri. "Shah Rukh Khan's Zero: Now On Alexa, Whatsapp, And Beyond". Forbes. Retrieved 2018-12-18. ↑ "Zero Becomes India's First Movie to Launch Snapchat Lens! Its Lights, Camera, Snap for SRK-Starrer". Latestly. 18 December 2018. Retrieved 18 December 2018. ↑ "Zero: Shah Rukh Khan's Bauua Singh Sitting On a Ledge With a Chimp is the Most WTF Poster of the Year!". Latestly. December 18, 2018. Retrieved 2018-12-19. ↑ "Zero song Heer Badnaam features Katrina Kaif, Shah Rukh Khan and a surprise. Watch video". www.hindustantimes.com. 2018-12-20. Retrieved 2018-12-20. ↑ "Zero song Heer Badnaam: Katrina Kaif's stardom is presented perfectly". The Indian Express. 2018-12-20. Retrieved 2018-12-20. ↑ Entertainment, Red Chillies (20 December 2018). "Sach kehte hain pyaar ki koi seema nahi hoti, ye to pyaar mein akaash ke bhi paar nikal gaye.ZeroTomorrow". @RedChilliesEnt (in Hindi). Retrieved 20 December 2018. ↑ "To the Moon and Back! Shah Rukh Khan and Anushka Sharma's New Zero Poster is Dropping Major Hints About the Plot of the Film". Latestly. 20 December 2018. Retrieved 20 December 2018. ↑ Sarkar, Suparno (2018-12-20). "Zero movie review and rating: What critics have to say about Shah Rukh Khan film". International Business Times, India Edition. Retrieved 2018-12-21. ↑ "Zero Movie Review: Katrina Kaif Gets Unanimous Praise from the Critics as She Delivers Her Best Performance Yet". Latestly. 21 December 2018. Retrieved 2018-12-24. ↑ "Zero box office collection Day 1: Zero fails to impress critics; all hopes on weekend earnings now". www.businesstoday.in. Retrieved 2018-12-21. ↑ "Zero: Manmarziyaan writer Kanika Dhillon calls Shah Rukh Khan starrer one of the most important films of 2018". www.indiatvnews.com. 2018-12-23. Retrieved 2018-12-24. ↑ "Zero movie review: Shah Rukh Khan dazzles in a strange romance". www.hindustantimes.com. 2018-12-21. Retrieved 2018-12-21. ↑ "Zero: Shah Rukh Khan, Katrina's compelling performances take this film from average to ambitious- Entertainment News, Firstpost". Firstpost. 21 December 2018. ↑ "Zero Movie Review: Shah Rukh Khan Powers This Ambitious Drama With A Terrific Performance". HuffPost India. 2018-12-21. Retrieved 2018-12-20. ↑ "Zero, this very literal flight of fancy, is the year's most audacious love story". Film Companion. 23 December 2018. ↑ Guha, Kunal GuhaKunal; Dec 21, Mumbai Mirror | Updated:; 2018; Ist, 06:32. "Zero review: Shah Rukh Khan Anushka Sharma-starrer Zero is a half-baked love story". Mumbai Mirror. Retrieved 2018-12-21. ↑ "Zero movie review: Shah Rukh Khan, Anushka Sharma and Katrina Kaif starrer is a reflection of its title | Entertainment News". www.timesnownews.com. Retrieved 2018-12-20. ↑ "Long and short of it | Rajeev Masand – movies that matter : from bollywood, hollywood and everywhere else". www.rajeevmasand.com. Retrieved 2018-12-21. ↑ "Zero Movie Review: A Bizarre Story That Leaves You Stumped, And Eventually, Sad". Film Companion. 2018-12-21. Retrieved 2018-12-21. ↑ "Zero Movie Review: Shah Rukh Khan, Anushka Sharma, Katrina Kaif Get A For Effort In Outlandish Film". NDTV.com. Retrieved 2018-12-21. ↑ "Zero movie review: Shah Rukh Khan's comic timing is the only thing going for this spluttering, tottering affair- Entertainment News, Firstpost". Firstpost. 2018-12-21. Retrieved 2018-12-21. ↑ adarsh, taran (21 December 2018). "Zero: FIASCO. Expected so much from this collaboration [SRK and director Aanand L Rai]… Sadly, the flawed writing - especially the second hour - takes the film downhill... EPIC DISAPPOINTMENT..." @taran_adarsh. Retrieved 21 December 2018. ↑ "Zero movie review: Preposterous drivel". The Indian Express. 2018-12-21. Retrieved 2018-12-21. ↑ "SRK's 'Zero' Lands Nowhere With Its Shoddy Script". The Quint. Retrieved 2018-12-21. ↑ "Amber Heard on Life After Accusing Johnny Depp: I was Told I'd Never Work as an Actress Again". News18. Retrieved 2018-12-21. ↑ "Zero is a surreally bad Shah Rukh Khan starrer, but a worse Aanand L. Rai film". Film Companion. 2018-12-21. Retrieved 2018-12-21. ↑ Taran Adarsh [@taran_adarsh] (26 December 2018). "#Zero witnessed growth on Day 5 [#Christmas]… Day 6 [Wed] and Day 7 [Thu] biz crucial... Fri 20.14 cr, Sat 18.22 cr, Sun 20.71 cr, Mon 9.50 cr, Tue 12.75 cr. Total: ₹ 81.32 cr. India biz" (Tweet) – via Twitter. ↑ "Zero Box Office Collection Day 2: Shah Rukh Khan And Anushka Sharma's Film Continues To Struggle. Earns Rs 38.36 Crore". NDTV.com. Retrieved 2018-12-23. ↑ Bollywood Hungama [@Bollyhungama] (29 December 2018). "#BoxOffice: #Zero Day 2 (Saturday) U.S.A box office - 283,808 USD [Rs. 1.99 cr] from 262 screens" (Tweet) – via Twitter. ↑ "MMA Mirchi Music Awards". MMAMirchiMusicAwards. Retrieved 2019-02-20. ↑ "11th Mirchi Music Awards: Complete list of winners - Times of India". The Times of India. Retrieved 2019-02-20.